Fourteen years ago this month I held out a trembling hand as my then seventeen-month-old son’s pediatrician shoved some incomplete articles with the word “autism” prominently placed in the title, wished me luck, and hastily exited the room. He literally couldn’t get out of there fast enough. I was left alone to dress my toddler, the same one I’d been told three months before was only slightly delayed, was taking after his father’s childhood development, and not to worry. I remember my hands being so cold while dressing him, feeling numb, in shock. I couldn’t get out of there fast enough either, with my son’s prescription for reflux medicine clenched in my hand. I made it to my car, seated my son, and collapsed. Not a banner experience in our autism journey. Fortunately, we’ve come so far from that terrible day. 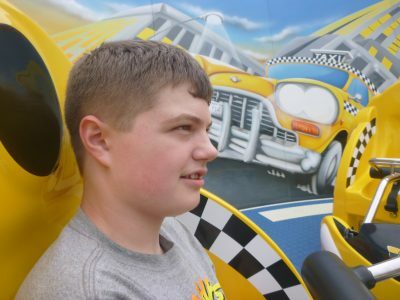 Justin, my severely autistic son, has had many challenges his entire life. There were years I thought he’d be in diapers until he was fifty. We’ve had to have feeding specialists come to our home when he decided to stop eating. Sleep was an elusive dream, aggression at times an unwelcome and frequent companion. It has not been easy chez McCafferty. The truth is, fourteen years after that awful, despairing day, even despite the extreme challenges of the past year, we are in such a better place with our son, one I would not have dared hope for over a decade ago. I could tell you his success stems from many things. He had excellent Early Intervention services in New Jersey when he was young. He is in a stellar private autism school. We’ve had excellent ABA services and speech therapy for him since he was little. He has the support of our extended family, and has benefitted from POAC Autism Services’ many events when he was younger. He’s had many interventions with his school’s knowledgeable BCBA. Most importantly, his success stems from his innate desire for happiness. All of these things and more have contributed to where he is today, but here’s one thing that’s helped so much that I wish someone had emphasized to me when he was diagnosed at seventeen months. Sometimes it’s the little things that contribute the most to growth. When Justin was diagnosed we lived in Virginia, and there was no Early Intervention services worth speaking of at the time. My husband and I hired an outside ABA firm to train us and two therapists, and between the three of us we delivered about thirty-five hours a week of ABA therapy to my son for close to a year-and-a-half. I ended up doing the lion’s share simply because our insurance didn’t cover the therapy back then. I admit there were days it was grueling to work with Justin; some days it was fine but I was overwhelmed with the weight of the importance of what I was doing, how it could affect his whole life. I was often tired, stressed out, and worried I wasn’t doing it right. But I kept on working with my son, pushing the both of us each day just a little bit more. Within months we saw a happier child acquiring skills easier and easier with each passing day. I was a very intense mother those first few years after his diagnosis, when we didn’t know where he’d end up on the spectrum. We know now that Justin will remain on the more severe end, and as I’ve accepted this prognosis I still feel intensely about his progress, but I’ve shifted my goals for him. We still pay attention to the little things, the follow-up, the need to see the skills he learns in school crossover to our home and outings. We continue to push him when we can, to follow up on that suggestion from his teacher or therapist, to not let his acquired skills fall by the wayside. And yes, it was the big things that brought him to the place he’s in now- the decision to move to New Jersey for real Early Intervention services, the research we did to help get him his private placement. Those things are huge contributing factors in how well he’s doing now. But I will never discount the little things too. The pushing him just five minutes more in a therapy session. Staying ten extra minutes on an outing just to show him he could do it. Following through on those suggestions from his therapists. Helping him reach a more independent place even when the getting there was difficult. Autism can be hard, sometimes excruciatingly so. None of us as parents can be perfect every day. But as often as you can, try for that extra moment of connection, that acquisition of one more step toward an important goal, push your son or daughter just a little bit more on an outing. Each tiny success accumulates, slowly and subtly making things easier for your child, and for you. Even when you’re so tired, and I’ve been there, it’s worth the effort.